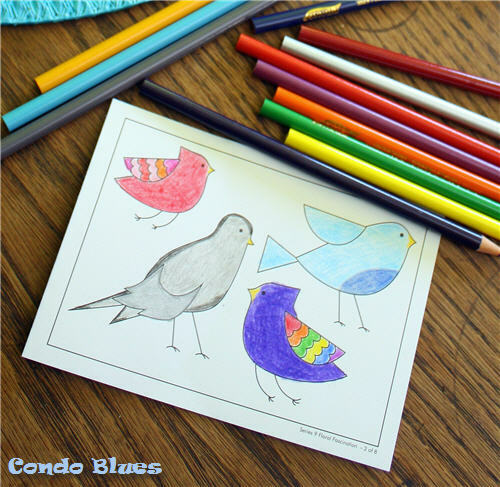 Condo Blues: Project Me: Fight Stress with Coloring. Have You Tried It? Project Me: Fight Stress with Coloring. Have You Tried It? One of my friends has a tote bag that says, “I knit so I don’t kill people.” I can relate. To part about relaxing or recharging through a creative project, not the part about knitting. I don’t know how. I suppose that’s one of the reasons adult coloring books are so popular. You don’t need a garage full of fancy tools or lessons to de-stress by coloring. All you need is a couple of bucks for a coloring book and some crayons (Environmental Working Group has a a list of safe non toxic crayons here) or colored pencils and you’re good to go. I haven’t colored since I don’t know when. One evening when I was looking for something to do, I spied the coloring page Zulily.com put on the back of the Thank You card that came with my last order in the To Recycle pile by the back door. Coloring at the wood kitchen table added a surprise texture. Not bad! It was relaxing and low key. I wouldn’t mind coloring in the future. I figure that I better look for an adult coloring book rather than constantly buying things from Zulily flash sales for the Thank You card coloring sheet*. I don’t have to patience to finish the overly detailed and complicated designs in most adult coloring books and children’s coloring books are way too simple. I knew my friend Colleen from Just Paint It was creating an adult coloring book (I featured Colleen's custom dog portraits in this past post.) I like Colleen’s art. I couldn’t wait to see what she had planned. 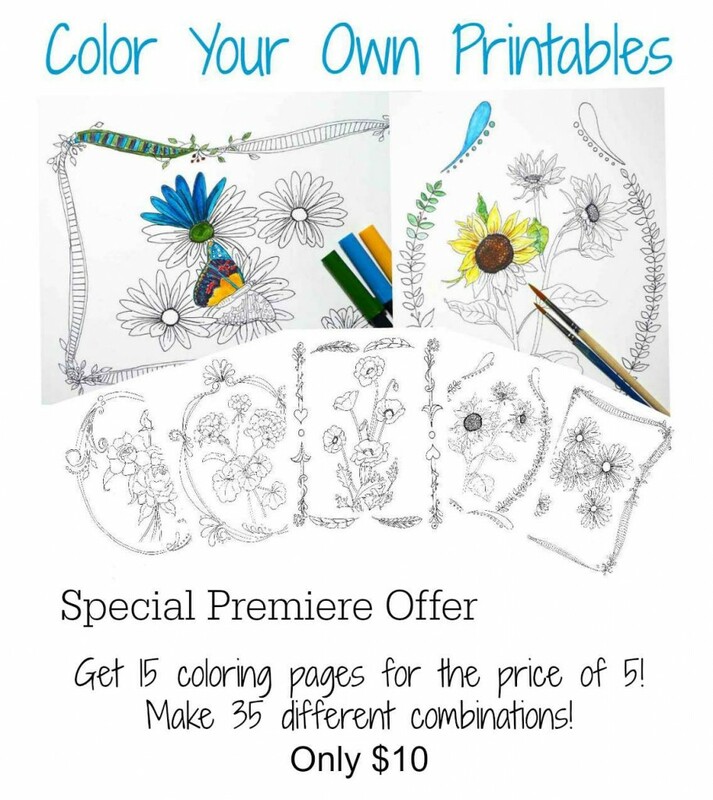 Colleen recently released Color Your Own Printables and I think Colleen’s coloring pages are the best of both coloring worlds! They bridge the gap between big cartoony kid blobs and itty bitty teensy tiny adult coloring designs that give me eye frazzle. Even better she has options that let you mix and match the designs. So if you want to just color flowers or a just a frame to use in a craft or decorating project you can without resorting to White Out or scissors. I swear she is genius who thinks of everything! The frame pages give me ideas for making colorful framed quotes. I rarely print in color because my inkjet cartridges dry up so quickly I stopped printing in color. But coloring or painting a black and white high res print? That I can do. Colleen drew by hand each coloring page and scanned at a high resolution for quality prints. Once you purchase the premiere this package you’ll be able to print as many copies as you want, alleviating the stress of making any mistake and allowing you to experiment with different media. 15 designs for a mere $10.00? Yes please! 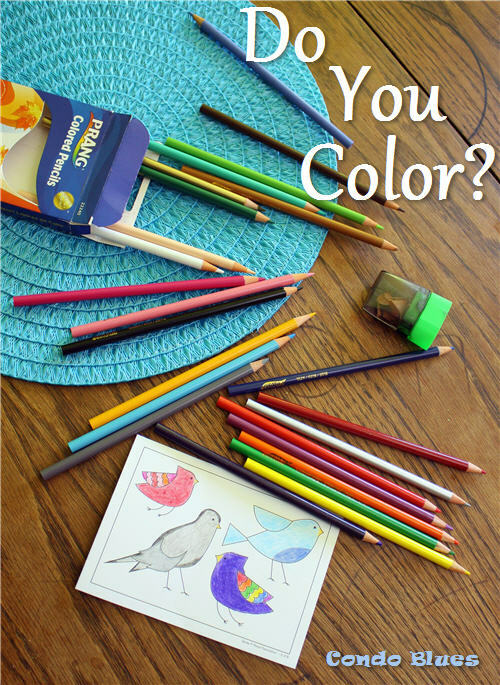 Do you color? What do you do with the pages after you finish them? *Who am I kidding? I won’t be making random Zulily purchases for the coloring card but that’s not going to stop me from keeping an eye on Zulily’s flash sales when it comes to shopping for meaningful Birthday and Christmas gifts. It is August and I am DONE with my Christmas shopping and I got it all at 50 to 80% off! I like Zulily so much I am a Zulily affiliate because I only promote the things I truly use and love. Further Disclosure: I’m not an affiliate for Just Paint It or Color Your Own Printables. Colleen didn’t ask me or pay me to tell you abut it. I wanted to share it because I like Colleen’s work, think you might too, and Colleen is one of the nicest people around! Besides Color Your Own Printables has much nicer and more mature designs than the Avengers coloring book I bought at the dollar store.